I love flowers. Cut ones adds so much warmth, color, flagrance and enjoyment to any room in your home. I make a variety to choose from to suit your taste, but I always make them to stand alone with elegance, whether or not you have fresh or silk flowers in them. Here I have placed a selection of stoneware vases and certain Raku vessels. Raku will not hold water, but silk flowers are so real looking these days they would be lovely. Or a plastic liner could be used for fresh flowers. Love birds gathering berries bless this lovely vase. If you love birds and flowers this vases is for you. The doves are carved out of the side and replaced for a 3D appearance. I glazed this vase with two blues and red berries. It comes in this combination. It is 8” tall and will add grace to any room. 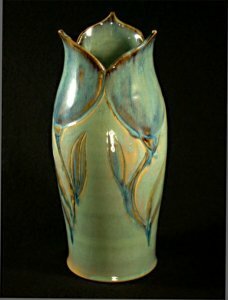 This elegant vase is reminiscent of tulips just opening. I have glazed it in two tones to highlight the pedals carved in the rim and the incised leaves and stems in the body. It is 8″ tall and come only in the color you see, sea green with blue accents.